Historic UK brewer Charles Wells has sold its brewery and the majority of its beer brands to rival Marston’s in a deal worth £55 million, which excludes its chain of pubs in the UK and France. The sale of its brewery and brands signals Charles Wells’ exit from higher volume national sales in favour of a more local and smaller scale brewing future in Bedford, with plans instead to invest in a smaller brewery to supply its pubs. 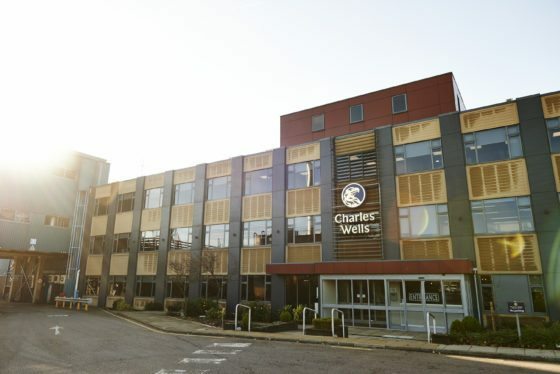 Charles Wells’ Eagle Brewery in Bedford, which opened in 1976 and has the capacity to produce more than one million hectoliters, is the home of brands including Bombardier, Courage, and McEwan’s, all of which will now come under the ownership of Marston’s. The sale also includes the UK distribution rights for Kirin Lager, Estrella Damm, Erdinger and Founders, and the exclusive global license of the Young’s brand. In addition, its Cockburn & Campbell wine merchant business will also transfer to the ownership of Marstons. Employees at the brewery in production, national sales, and brands marketing will transfer to Marston’s. Charles Wells Ltd will retain ownership of its Charlie Wells and John Bull beer brands. It is the second big purchase of a rival brewer for Marstons in recent years, having purchased Daniel Thwaites’ beer division in a cash deal worth £25.1 million in 2015. “Marston’s is delighted to have reached this agreement with Charles Wells and is absolutely committed to the future of brewing in Bedford,” said Ralph Findlay, chief executive officer of Marston’s PLC. Charles Wells announced that it would be downsizing its brewing operation and followingthis sale would be investing in a small new, Bedford-based brewery to supply beers to its pub customers in the UK and Europe. Brewing and supply agreements will be made with Marston’s for interim brewing and longer term exclusive pub distribution services. The Charles Wells pub estate will also have the benefit of the wider beer and wine range available from Marston’s. Going forward, its key focus will be the expansion of its managed pub businesses in the UK and France through acquisition, alongside additional investment in its leased and tenanted estate. Commenting on the deal Tim Page, the Campaign for Real Ale’s (CAMRA) chief executive said it was “always concerned” about any consolidation in the brewing industry, as it could result in a “reduction in choice, value for money and quality for beer drinkers”. “We’re also wary of one company increasingly controlling a larger and larger share of the market, which is seldom beneficial for consumers,” said Page. “Marston’s has a positive track record of keeping the breweries it acquires open, in situ, and in many cases investing in the sites to increase capacity, and we urge them to continue that policy. We’d also encourage them to protect the brands that they have acquired and increase the range available to beer drinkers, by continuing to supply them alongside the existing beers produced by Marston’s owned breweries. Charles Wells was founded in 1876 and today owns over 200 pubs in England and France.